I know, I've been thinking about Christmas cards quite a bit this month, but Christmas in July is a pretty popular theme, don't you think? Besides, it really is never too early to get started on holiday cards. In anticipation of an order arriving from the new Stampin' Up Holiday Catalog, I thought I'd use up some retired products from years past to make room. I used two retired products in this card, the designer paper and ribbon. The stamp sets, Lovely as a Tree and Petite Pairs, are both current sets. If you wanted to re-create this card using current DSP and ribbon, trust me, it won't be a problem. Wait until you see the selection in the new Holiday catalog! I went with a clean and simple style in non-traditional Christmas colors that I think would be very suitable as a masculine holiday card. 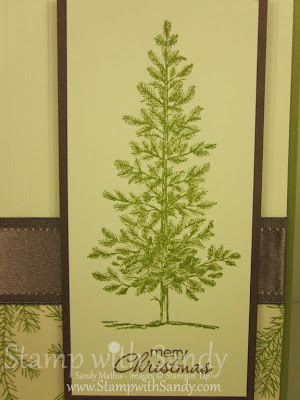 The beautiful tree image is classic and elegant and needs no embellishment. 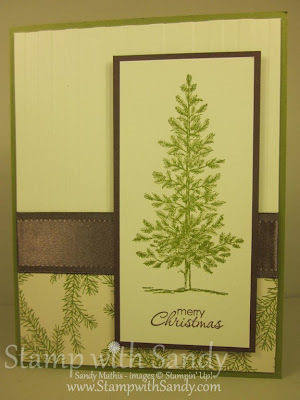 This is also a quick and easy card to mass produce, the best kind for the holidays! I love the simplicity and elegance of this card.